Learn how to setup a ventilation system to control temperature, humidity, odor and CO2 in your garden! Looking to Control Your Dehumidifier? 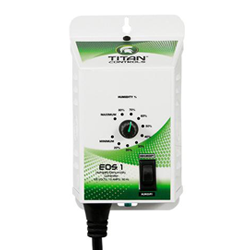 Take control of your humidity in your garden with a controller from Titan Controls. These easy-to-use humidity controllers will keep your RH% right at the sweet spot! While a certain level of humidity is desirable for greenhouses or indoor gardens, too much humidity can lead to serious problems for your plants. If you are experiencing excess moisture in your grow room, you will need a dehumidifier. Similar to how humidifiers raise the humidity, dehumidifiers lower the humidity by removing moisture from the air when it gets out of the ideal range. When humidity is too high, it can result in the dreaded bud rot and other molds forming. Too much humidity will also slow growth to a halt. What should the humidity be in a grow room? Plants should be grown under different humidity conditions depending on which stage of their life they are in. Seedlings and clones require high humidity levels of 70-75%. As the plant begins vegging, slowly lower this until you reach humidity of 50-70%. During flowering, lower humidity further to 40-50% and try and keep it within this range through harvest. While all indoor operations will benefit from a dehumidifier, they are especially essential for hydroponic systems. Proper ventilation will help control humidity levels as well, so be sure to implement a fan or blower. What size dehumidifier do I need? If you are still unsure which dehumidifier is right for you, check out our full guide on how to size your dehumidifier. At Hydrobuilder we have portable dehumidifiers for hobby farmers with small grow rooms, and commercial dehumidifiers capable of removing moisture from a large greenhouse or warehouse grow. If you want to learn more about creating an ideal environment for your plants, check out some of our learning center articles. If you still have questions, give one of our experienced growers a call today at 888-815-9763!